New year, new house, new recipes! My husband and I moved last month – as an aside, I now know why so few people opt to move in December – between the closing, the packing, the moving out and the moving in, and the holidays, I needed a few weeks to recover! We’re now settled comfortably into our new home, and I finally have time to cook again. Now that football playoffs are upon us, it’s that time of year where one needs an arsenal of appetizer recipes to have on hand for the boys. Frankly, even if you’re not going to be watching the playoffs (sorry to the Eagles, Colts, Saints & Chiefs fans out there), winter is a great season to find a warm afternoon snack to have around for entertaining. My January series of posts will involve a number of tasty, easy & economical hot appetizer dips to prepare for your upcoming football festivities…or any other upcoming events you may have that are not related to sports. 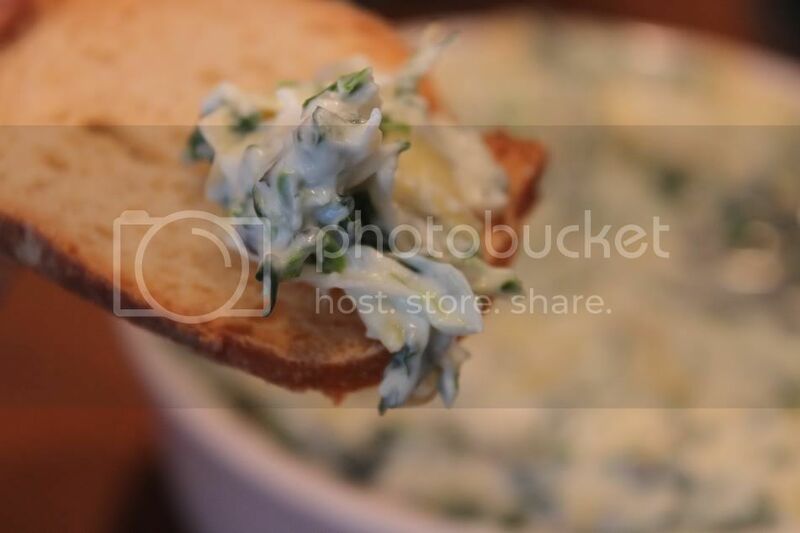 In my opinion, there are few appetizers more enjoyed than a nice warm Spinach & Artichoke dip, accompanied by some crispy crostini. A few years ago, my co-blogger Beth posted a similar recipe as part of her homage to Superbowl Snacks - I made this slightly different recipe during the holidays this year, and it was both so easy and received such rave reviews that I promptly decided it is a definite keeper. I served this with homemade crostini (really just a fancy word for toast) which I made myself by toasting thin slices of sourdough baguette. It also is fantastic with tortilla chips or potato chips…and if you’re feeling especially healthy for your New Year’s resolution, it would also taste good with fresh vegetables too. Like Beth’s, it has the distinct advantage that you can prepare it in advance – right through the final step of topping with mozarella and baking – which may make your Sunday afternoons more fun over the next few weeks if you are going to be watching the boys party for a few weeks, like me. PS – it also involves the ever useful frozen spinach! Preheat oven to 350. (Unless you are making it in advance – then no need right now!) Blend together the cream cheese, mayo, parmesan cheese, garlic, basil and salt. Stir until well combined. Gently fold in the artichoke hearts and spinach. (If preparing in advance – stop here!) Place into an oven-safe small baking dish. Top with mozarella cheese, and bake at 350 degrees for 30 minutes. To make crostini: Slice a baguette (I used a sourdough baguette) into 1/4 inch thick slices. Place slices in a single layer on a cookie sheet. Toast at 350 degrees for 12 minutes. Call them crostini, and everyone will think you are about to win the next Iron Chef.